I found this statement to be quite poignant in its simplicity and accuracy in summarizing the necessity of quarantining animals in the reef aquarium hobby; or, better yet, the folly of not using a quarantine tank. If you talk to a group of industry professionals and experts and ask them for one thing that could help to make or break an aquarist's experience, the advice to quarantine one's livestock is likely to be a popularly expressed opinion. In fact, many authors on aquarium keeping have, in their own books, advocated quarantining (Borneman, 2001, Calfo, 2001, Delbeek & Sprung, 1994, Fenner, 1998, Paletta, 2001, and Tullock, 2001). Take another look at that list of authors. 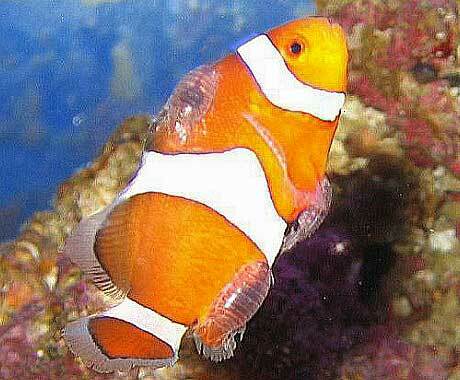 It is a veritable "Who's Who" of marine aquarium keeping. And, those are just the ones from whom I could find a reference regarding the importance of quarantine. I am sure other respected authors and individuals also advocate quarantine, but I simply didn't have their book or article in my library. Probably no one piece of technology or type of methodology separates the successful, long-term aquarium hobbyist from the hordes of individuals who have aquariums collecting dust in storage, or are trying to recoup some of their costs from a failed marine aquarium adventure at garage sales, more than the use of quarantine. The purchase of a tank and associated equipment for use as a quarantine facility is one of the simplest and most inexpensive investments one could make in the safety and well-being of our aquatic pets. Yet the use of a quarantine system is one of the most often underrated or improperly applied methodologies in the hobby. Please note, I am not talking about just fishes here. I would urge aquarists to quarantine everything added to their tanks that could possibly carry a pathogen or pest, or that needs extra care: fishes, motile invertebrates, corals, live rock, live sand, etc. Basically, anything that is wet should be quarantined. In this article, I hope to demonstrate the merits of quarantine (and supplementary preventative treatment when necessary) and also to demonstrate an inexpensive model for hobbyists to use to properly isolate their new acquisitions while keeping them healthy. There are several reasons to employ a quarantine tank. The first and foremost is disease prevention and treatment. While some hobbyists may argue that Marine Ich is always present, or that all that's required is a healthy display and the fish's own immune system will take care of any disease, the fact is these opinions are just that - opinions. They are not supported by science. Truth be told, I used to believe the first, that Marine Ich is always present. It was aquarium folklore that was passed down to me and I bought into it. 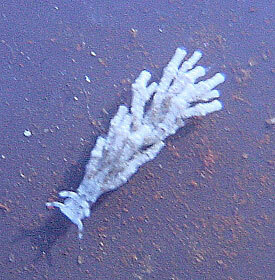 That is, until I did some independent research into Cryptocaryon irritans, the pathogen known as Marine Ich. First, Cryptocaryon irritans is an obligate parasite (Dickerson & Dawe, 1995), meaning it cannot live without a fish host. Second, Cryptocaryon irritans can be killed by a number of scientifically proven methods (Noga, 2000). If this parasite is never introduced into a tank, then susceptible animals can never get infected. All the stress in the world cannot make a parasite magically appear out of nowhere. A proper quarantine protocol allows time for any diseases to progress to the point when they are noticeable and hopefully identifiable. This isolation period also permits the hobbyist to treat the disease with the best course of action without a concern for collateral damage to the sensitive life found in a healthy reef or a fish-only with live rock (FOWLR) display. And last, it allows for the option of prophylactic treatment of animals that are commonly infected with certain diseases. But, disease prevention and treatment are not the only benefits of quarantine. If a fish is sick, the period in a quarantine tank allows that specimen time to recover from the ailment and its aftereffects. Sick fish often refuse to eat. This is often one of the first signs that something is wrong with an animal. A quiet, protected environment, free of competing animals is a perfect place for a recovering animal to put on weight, rebuild its fat reserves, and allow for any damaged tissue to heal (such as open sores from parasitic attachment points or ragged, torn fins). And, the fish does not have to be sick to benefit from this quiet time. Fish that have endured the rigors of transport and of making their way through the chain of custody from the reef to the home aquarium can use some tender loving care. In some instances, it might have been days or weeks since they had been fed or had accepted food that was offered. Remember, the food items we offer are unnatural. It takes time for the fish to become accustomed to prepared foods. Many grazing fish, like Angelfish and Tangs, have evolved to constantly scour the reef substrate looking for food. The aquarist should expect that it will take some time to train them to look up for food and to recognize that the debris raining down from above is actually edible. Throwing a malnourished fish into a display tank where it must immediately compete with the current occupants for territory and food is not a recipe for success, in my experience. On the other hand, fattening up a new acquisition before introduction to the main display greatly increases the odds that it will be able to effectively vie for space and food when placed into its new home. alone in quarantine to recuperate. Photo by Steven Pro. Many of the same benefits that fish can derive from a quarantine period also accrue to the animals we collectively refer to as 'corals.' Just like fish, corals can harbor pests and pathogens. Placing these specimens in isolation allows for close, careful observation and screening for potential problems without needlessly exposing the rest of the main display. It also gives the colony some time to recover from shipping stress. If you have never imported corals, let me assure you there are anomalous losses from the trauma of being stuffed into a relatively small shipping bag, then kept in the same minute volume of water in complete darkness, while exposed to the elements and "gorilla" airline freight personnel. 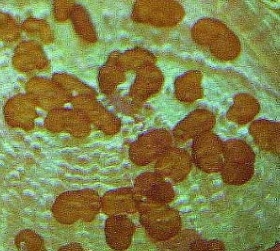 Many LPS corals suffer from tissue abrasion and subsequent secondary infections due to banging into the sides of a plastic bag for extended periods. Euphyllids are particularly prone to this condition. Also, Xeniids commonly "melt" after shipping, plausibly because of the trauma of transit. Some sponges can get air trapped inside their tissue and rot from the inside out. The list goes on and on, and I for one would rather have any rotting, necrotic tissue confined to the safety of a quarantine system than introduced into a display tank where an influx of nutrients and toxic metabolites from the decay could foster nuisance algae at best, or perhaps foster bacterial infections among other susceptible display animals. Let's take a brief moment to mention the staggering variety of pests, predators, and pathogens that one wants to avoid importing with a new acquisition. For fish, the most common diseases are parasitic and can easily destroy all fish in a tank in days to weeks if left untreated. Furthermore, most of these cannot be consistently dealt with in a natural-style display (in the presence of live sand, rock, invertebrates, etc.). Some people have had luck using various homeopathic or allegedly reef-safe medications, but none of these have been demonstrated effective, and not even the anecdotal reports of success are consistent. Sometimes it appears they work, other times they don't seem to make a difference at all. Cryptocaryon irritans (Marine Ich) and Amyloodinium ocellatum (Marine Velvet) are the two most commonly encountered parasites, and either can wreak havoc on a system. Many others are less frequently encountered, but aquarists should still look out for: Brooklynella, Turbellarian worms (Black Ich), Uronema, and various types of flukes, to name just a few. Damage on a beautiful coral, Pocillopora sp. (left), caused by a Coralliophilid parasitic snail (right) that most likely hitchiked into the aquarium with some live rock. Photos courtesy of Graham Stephan (Pineapple House). In the case of invertebrates, the water used to transport them from the store to the display aquarium could harbor free-swimming stages of fish parasites. 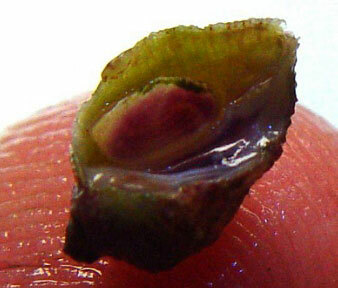 Hermit crabs or snail shells could be a way for the cysts of these same parasites to hitchhike into a display tank. Again, it is better to be safe than sorry. Quarantine these animals. Two common pests typically imported via live rock: Left: Aiptasia sp. Right: Anemonia majano. A Cirolanid isopod. Photo courtesy of John Loose (lllosingit). Live rock can harbor an array of undesirable creatures. Again, the tomont stage of fish parasites like Cryptocaryon or Amyloodinium could hitchhike in unquarantined live rock. 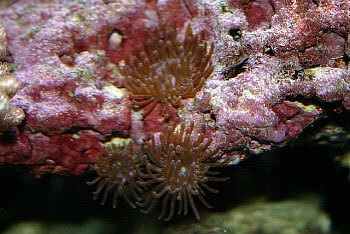 In addition, the nuisance anemones Aiptasia and Anemonia majano are commonly imported this way, as are, to a lesser extent, pests such as flatworms and some nudibranchs. And finally, with the ever-increasing popularity of aquacultured live rock from the Atlantic, we are beginning to see an increase in the appearance of pests such as Cirolanid isopods (photo left), mantis shrimp, and the large Caribbean fireworm (Hermodice carunculata). While I very much approve of aquacultured rock because of the abundance and diversity of creatures that come with it, as well as for conservation reasons, these are common issues with this substrate. Along with the good comes some bad, and one must be prepared to deal with it and the easiest way is by using an isolated quarantine tank, rather than in the main display. A predatory nudibranch seen here consuming polyps on a Montipora digitata. Photos courtesy of Skip Attix. 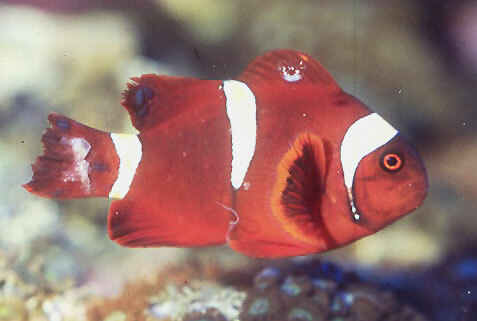 This unfortunate Amphiprion ocellaris is the victim of an attack from several Cirolanid isopods. Photo courtesy of John Bass (NoobieNemo). 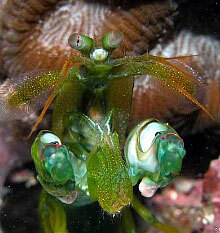 A mantis shrimp can wreak havoc on many inhabitants of a typical reef aquarium. Photo courtesy of James Fatherree. The organisms we collectively refer to as 'corals' also have their fair share of potential risks if added to a system without a quarantine period. Small polyp stony corals, in particular Acroporids, could undergo the contagious shut-down reaction, better known by its acronym, RTN. Aquarists must also watch out for the red Acropora copepods, ciliates, flatworms, hydroids, or even parasitic snails on various SPS corals. 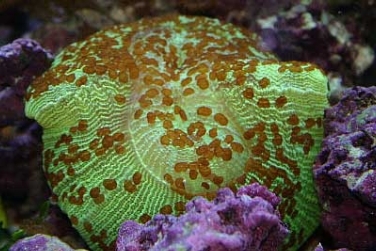 Large-polyped stony corals, like the Euphyllids, routinely suffer from the so-called "brown jelly" infections upon importation, also common following tissue damage. Various predatory snails, like the Pyramidellid snails with Tridacnid clams or the box snails with zoanthids, also hitchhike into our tanks. Additionally, flatworms or coral-eating nudibranchs (the ones associated with Montipora seem to be rather 'popular' these days) could be hiding in and amongst that newest acquisition awaiting the smorgasbord that is your beautiful reef display. Even soft corals bear parasites and unwanted predators, such as flatworms, nudibranchs, and mollusks that are often well disguised in mimicry of their host corals. Similarly, zoanthids carry the small and cryptic sundial snails that consume their host polyps. In my opinion, it is much better to be safe than sorry. Quarantine all these animals, too. Left: I dont know if I would consider this an Open brain coral with a flatworm problem or a flatworm colony with a coral problem! Right: a close-up of the flatworms. Photos by Steven Pro. 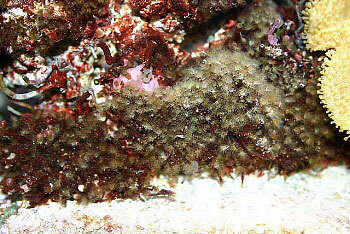 Left: Powerful stinging hydroids, while not as prolific as Aiptasia, can still be problematic in a reef tank. 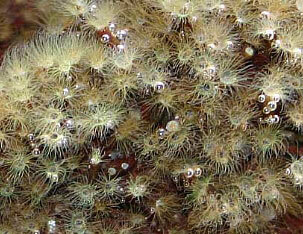 Right: a close-up of the hydroids. Photos by Steven Pro. Let us assume for the moment that after having decided to forgo a proper quarantine period and instead placing questionable livestock into the display, it is now contaminated with some pest or pathogen. What are you going to do then? Having chosen not to quarantine, it is highly unlikely that the aquarist is prepared to quarantine after the fact. The mistake has already been made and some undesirable organism has been permitted to infest the display. Instead, the problem is often exacerbated by the use of some wonderful medication that is alleged to be 'reef-safe'. I have never understood the meaning of this term. Has the manufacturer conducted extensive toxicology tests to prove that this drug, at its recommended concentration, will not adversely affect the myriad of life that is present in a mature reef display? If it has, I have never seen any of the test results published. Furthermore, I have not seen many manufacturers publish data demonstrating that their products are even effective, let alone safe. Do aquarists actually consider exacerbating the problem by utilizing unproven and potentially dangerous drugs to affect a cure? Let's hope this course of action is not chosen. Instead, quarantine and treat the infected individuals and any other potential hosts while allowing the display to go fallow (without any hosts) until the pathogen or pest population dies out. In many instances, one to two months should suffice. In some cases, like Cirolanid isopods, three months may be required (Shimek, 2002). But, that is not an argument against this course of action. On the contrary, it is a strong argument to have and utilize an effective quarantine protocol in the first place. Aeolid nudibranchs on a plating Montipora sp. Left: A close-up. Right: The eggs can be clearly seen in this photo. Photos by Adam Cesnales. Pyramidellid snails (the small specks on the right) preying upon on a Tridacna derasa. I am also reluctant to add anything to my display, be it a medication or an alleged beneficial supplement, unless I know three things: 1) what it contains, 2) if it been proven to work, and 3) it is it really needed (the best solution)? The first one is easy enough to verify. Does it have a list of ingredients? If not, I won't even consider using it. The second qualifier is also easy to check. Have there been published, peer-reviewed data to support the manufacturer's claims for marine species, or even any other species for which the mode of action has some basis? If a supplement is not proven to be beneficial or a medication not demonstrated to work, again I pass. Last, can I verify the concentration in my aquarium? 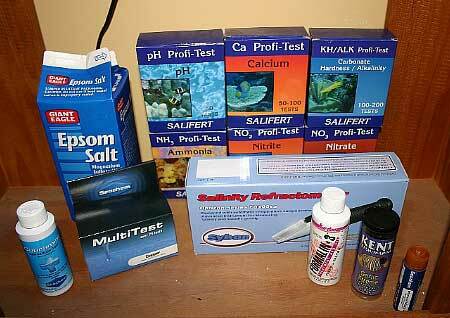 Supplements like calcium, magnesium, and alkalinity pass all of these tests. Manufacturers list the contents, it can be proven that they are necessary, and they can all be tested to confirm or correct the dosage given. There are also treatments that can jump these hurdles, such as hyposalinity and copper. On the other hand, I am unaware of any alleged 'reef-safe' treatments that come with a test kit or have been proven effective. There are also several products that I like to refer to as "magical elixirs" that don't even list what is in them, let alone prove that they work or that their target concentration is available. Metronidazole. Photo by Steven Pro. When selecting an aquarium to use as a quarantine vessel, there are only a few things to consider. First, it must be proportional in size to the main display tank. If the plan is a 180-gallon reef display that is to be teaming with surgeonfish, a 10-gallon tank as a quarantine tank for fishes is probably a bad choice. Alternatively, if you have only a 55-gallon tank and you are a conscientious aquarist, there are few fish that could not reasonably be kept in a 55-gallon tank for their entire life that couldn't be maintained in a 10-gallon tank for one month. If a 150-gallon or larger tank is used for a display, consider purchasing a 30-gallon or larger quarantine tank if the larger display is to house larger-sized animals. Generally, aim for a quarantine tank that is at least 20% of the main display's volume, although bigger would be better. The author's quarantine tank is intended for fish only, but with a few PC fixtures standing by it can easily be used for quarantining photosynthetic plants and animals. Photo by Steven Pro. Another consideration for quarantine tanks is depth; the shallower the better as long as the depth is great enough to cover the intended quarantined livestock. This relates specifically to lighting for when quarantining photosynthetic plants, animals, or live rock. It is far easier and less expensive to light a shallow vessel than a deep one. For this reason, forgo the tanks designated in the trade as "high" or "extra high." 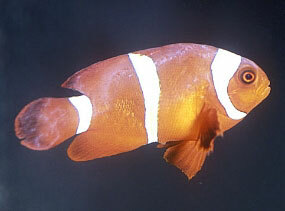 Shallow aquaria also have added benefits for dealing with fish in quarantine. 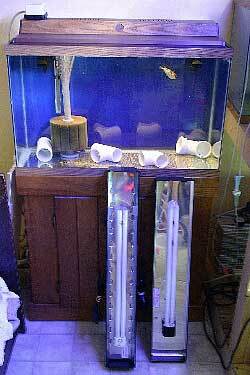 They generally have more square inches of surface space per gallon than the same size tall-style aquariums. This greater surface area does two things. It allows better gas exchange and therefore higher levels of dissolved oxygen (something that can be crucial in small aquaria) and a long, shallow tank has more swimming space for confined fishes. I also prefer to use an actual glass or acrylic aquarium rather than containers of opaque material because it allows easy viewing and monitoring of the things in isolation. Food-grade rubber and plastic tubs (like the type found at Wal-Mart or similar stores) can be used, but these are generally opaque or colored, making observations difficult. This, too, is a matter of proportion. If the aquarist has a display that costs thousands of dollars, perhaps tens of thousands of dollars, what is a couple of hundred more to ensure the overall health of the system? Dismantling an existing display, loss of livestock, and the purchase of various treatments can quickly exceed the cost of a simple quarantine system. If the additional cost is a concern, search through the local newspaper, which usually lists several used aquariums for sale. Garage or yard sales are another place where a real bargain can be had. A large number of people (who probably killed all their fish because they did not recognize the importance of quarantining) are always leaving the aquarium hobby, definitely making this a buyer's market. Finally, I prefer to use a background to cover the back and two sides of the tank. This keeps the aquarium a bit more subdued and seems to calm the quarantined fish a little more than if the movement from activity in the house is visible from all four sides. It is not really a hard and fast rule or a proven methodology, but intuitively it makes sense. I also paint the bottom of the tank because I don't use substrate in my quarantine tanks. This seems to stop reflections and appears to add to the fishes' comfort level. Most individuals that have quarantine tank problems are either unprepared or uneducated in what a proper quarantine tank's filtration must do. There must be some sort of fully functioning, cycled biological filter. Many times I have read of hobbyists who merely remove water from their main display, add a brand new or sterile filter, and think they are ready to go. They are often surprised by their subsequent ammonia trouble and its impact on their new acquisitions. There is nothing magical about aged water. Some small quantity of beneficial bacteria may be free-floating in the main aquarium's water, but it is not enough to sustain an ammonia-free environment in a newly established quarantine tank. Ammonia and/or nitrite poisoning is a real risk in quarantine tanks (really for any tank, for that matter, that does not have an adequate biological filter) if the aquarist is unprepared. I am of the opinion that most people who fail with a quarantine tank, fail because they overlook or misunderstand this key aspect. I don't want to discourage people from using water from their display to fill the quarantine tank; this is a sound practice. Aged water is much less harsh than freshly mixed artificial seawater, and results in an easier transition for the new animals to adjust. However, it simply does not take the place of a good biological filter. For simple biological filtration in a quarantine setup, I prefer air-driven sponge filters. These can be found at just about any aquarium store. They are very effective and inexpensive, although admittedly unattractive. If there is a sump on the main display, I would encourage the aquarist to place at least one small sponge filter there and keep it running at all times. This way, when the need arises, there will be a functional biological filter ready and waiting. While the nitrate produced by this unit may concern some, it should be of small consequence to most mature displays. With the increasingly common combined use of protein skimmers, deep sand beds, and macroalgae harvesting from refugium tanks, the minor amount of nitrate produced from one tiny sponge filter should be undetectable in an otherwise healthy display. If some aspect of husbandry is already lacking, this added nitrate is certainly not going to help, but the sponge filter can hardly be blamed. If the tank does not have a sump, a power filter that comes with a biowheel can work quite well. Or, some power filters are available that have large media baskets and durable foam blocks for a combination mechanical and biological filter. If these sponges are doubled up and fill the media basket, a very effective biological filter can be easily established. Again, whatever method is chosen, it should be operating on the main display tank so that it maintains a colony of beneficial bacteria. This way it is ready to be used at a moment's notice. One never knows when that "cherry" piece of coral is going to show up at the local fish store, or when that beautiful fish you have been searching for suddenly becomes available. Follow the Boy Scouts' motto and be prepared. By maintaining the biological filter in the main display, the quarantine tank can be stored until it is needed. This solves several problems. First, there won't be a second tank taking up valuable floor space in the house. Second, a proper quarantine tank is necessarily going to be unattractive. It should be bare-bottomed and decorated only with inert materials such as short sections of PVC pipe or fittings. Leave out the sand, live rock, or anything else that is porous or that could react with potentially required medications. Such a tank is certainly not something one would want to show off during a dinner party, so pack it up when it is not in use. Third, storing the tank prevents the aquarist from the temptation of slowly converting it into a second, smaller display or a frag propagation system or a larval fish grow-out tank or a phytoplankton culture station or a refugium (or whatever). Resist these urges and keep the quarantine tank out of sight when not in use. Some old "salty dogs" used to recommend keeping a damsel or similarly tough fish in the quarantine tank to keep the biological filter active. In this way the quarantine tank can be left up and running at all times. I really cannot think of a worse place to add a new, possibly sick, but definitely weakened acquisition. Damsels are extremely territorial, and in no time this fish would claim the entire quarantine tank as its, and its alone, home. Imagine taking one of those accountant types from Enron and throwing him into a jail cell with someone like Mike Tyson. It wouldn't be pretty. If you really want to keep the quarantine tank up and running, I would instead encourage dosing the tank with bottled pure ammonia or ammonium chloride, or simply feeding the bare tank, instead of using a fish. Numerous places online and in print discuss inorganic cycling of aquariums. Martin Moe's "The Marine Aquarium Reference: Systems and Invertebrates" discusses this method of establishing a biological filter, and I am sure online resources could be found with a quick search using the keywords, "inorganic aquarium cycling." But, I know if I had a spare aquarium running empty, it would be only a matter of weeks before I was utilizing it for a coral fragment grow-out. That is why I keep the tank packed away when not in use and the sponge filter operating in the sump of my display. Maintaining other live animals in the quarantine tank severely limits one's choices when it comes to treating sick fish, to the point that it is no better than having the sick fish in the main display. In addition to biological filtration, some other form of circulation to aid in water movement and gas exchange will be needed. A simple powerhead will work well for this purpose in a small tank; several would be needed in larger quarantine systems. Just be sure that its intake is properly screened to avoid sucking up and damaging or killing your newest purchase. Sometimes just a regular bioball placed over the intake will work, or even a simple sponge. Alternatively, special add-on devices can be purchased to keep errant animals away from the suction. No aspect of aquarium keeping is more likely to elicit strong opinions or spark a fight than a discussion on lighting. For that reason, I will try to keep my comments simple. First, it must be kept in mind what is the intention of quarantining photosynthetic plants and animals. The intent is to monitor them for pests and pathogens and to give them some time to acclimate from the stress of transportation. At this point it is not necessary to maximize their growth, nor is it necessarily time to bring out their best colors. That can all wait until they have been safely moved to the main display. In the meantime, meeting their basic requirements for energy is all that is required. To that end, thousands of dollars in high intensity lighting is an un-necessary investment. On the contrary, by selecting a shallow aquarium to serve as a quarantine tank, rather modest lighting can be provided and still maintain the health of your newest, allegedly super-rare, spectacularly colored Acropora sp. Additionally, somewhat subdued lighting is appropriate in many instances for freshly imported photosynthetic livestock (Borneman, 2001 and Calfo, 2001). Having suffered through the rigors of importation, high intensity lighting can be more stressful than a relatively lower light environment as long as the total energy demands of the specimen are met. I encourage the reader to browse the Internet looking for some of the astonishing things people are doing with their nano-reef tanks. Very High Output (VHO), power compact (PC) and Normal Output (NO) lamps can be quite effective on small, shallow aquaria. While these technologies may not generate the maximum growth or coloration, they are cost effective and are adequate to keep most anything alive during the quarantine period. And, given a proper acclimation to the main display tank's lighting, bleaching or light shock because of the lower intensity light on the quarantine vessel should not be encountered. This is another critical aspect of quarantine. If we are talking about fishes, then a competition-free environment such as a quarantine tank is the perfect place to accustom your newest acquisition to feeding in captivity. It is also a great place to fatten up an otherwise healthy, but thin, individual who has not eaten enough while navigating its way through the chain of custody from the reef to your home aquarium. And finally, this is a good time to encourage a finicky eater to take prepared foods. Fishes can be slowly weaned from live prey items, be they feeder fish, ghost shrimp, or crayfish consumed by Lionfish, Groupers, Eels, Triggers, and the like, or live brine and mysid shrimp for tough to feed Seahorses, Dragonets, Anthias, or others. During this quarantine period, slowly work frozen and prepared alternatives into the diet as these fish begin to associate people approaching the tank with feeding time. For sessile invertebrates, a good diet while in quarantine is even more crucial. Over the past few years, the importance of feeding the animals we collectively call 'corals' has become better understood. It has finally dawned on us that these are, in fact, animals and they do need to feed. Of particular importance when discussing feeding photosynthetic creatures in quarantine is the reality that they are not likely receiving light much beyond their compensation point. On the positive side, though, this energy demand can be compensated for with food. What is important is that it be the right kind of food. 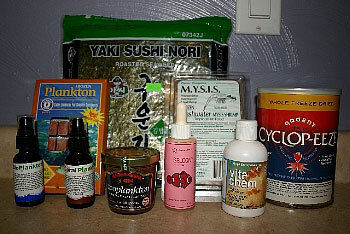 An assortment of foods (from left to right): LiquidLifes BioPlankton (phytoplankton), Sallys frozen Pacifica plankton, LiquidLifes CoralPlankton (rotifers), SweetWater Zooplankton (daphnia), sushi nori (processed seaweed), American Marines Selcon vitamin supplement, Piscine Energetics frozen Mysis shrimp, Boyds Vita-Chem vitamin supplement and Argents freeze-dried Cyclops-Eeze. Photo by Steven Pro. I am going to attempt to sum up in a couple of paragraphs what is really tens of thousands of words and several articles on feeding. I am necessarily painting with a rather broad brush, but this should hopefully be helpful and I would strongly encourage the reader to further research this topic by following the linked files in my suggested reading list. Below is a listing of the food items that I use. Under each one are the various animals I would attempt to feed each food while in quarantine. This is not a complete list of every kind of food or every kind of animal one may try to keep. It is simply an outline of my experience and general recommendations. So, how long do I have to wait? Ahhh, impatience. No character trait is more likely to kill aquatic pets than impatience, although laziness (which is related) comes in a close second in my book! If the time consuming process of curing live rock and cycling the aquarium was not enough to teach patience to the aquarist, a properly run quarantine will. There is no getting around it. For an effective quarantine, the new inhabitants must be kept for a minimum of one month. I feel so strongly about this that I would tell you not to waste your time if you can't commit to this amount of time. Time would be better spent learning to catch and remove all the fish from the main display for when an outbreak of a parasitic fish disease is encountered. Waiting that comparatively short period of time can be rewarded with the peace of mind of knowing that the health and well being of your pets has not been jeopardized. Given that most of the animals kept in reef aquaria have lifespans from decades to centuries, a month to help ensure their longevity is inconsequential. Furthermore, the proposition of holding an animal for a month will also enforce the notion that a quarantine tank must be a well-thought and designed simple system that does not cause more harm than good. Too many quarantine tanks are makeshift operations with conditions about equivalent in function to the shipping bag of water in terms of stress and water quality. By following the practices in this article, quarantine tanks should accomplish all the functions required of them. definitely recommended for fish in this condition. Photos by Steven Pro. Note that the one month minimum period is for a trouble free quarantine. If the tank has been treated with medications at any time, the countdown does not start until after the treatment is finished and the animals are in perfect health. Realistically, that means some specimens are going to spend two or more months in quarantine due to the time it takes to complete a course of the medication or the treatment protocol. Again, I can't caution aquarists enough. There are no shortcuts here. Anyone trying to dissuade you is probably just trying to convince you (and himself) that what they have been doing for years works fine. Don't be pulled to the dark side. The lure of simply tossing new fish and corals into one's tank is attractive, but the Fish Disease Forum is littered with individuals who bought into that mentality. It simply doesn't work in the long run. Eventually, the pets you bought and cared for will end up paying the price. I occasionally employ preventative treatment even when an infection may not have been noticed and I would recommend others do the same. The reason for this is some fish are routinely plagued by certain diseases. Many hobbyists miss the signs, or, even if they see initial signs, they often misdiagnose the malady and use the wrong treatment. Or, by the time they realize something is wrong and get the right medication, the fish is too sick to be saved. Because of that, I propose certain blanket treatment protocols for some fish. For instance, any surgeonfish/tangs that I import go through a hyposalinity treatment because of their propensity to be infected with Marine Ich/Cryptocaryon irritans. Also, I give all wild-caught clownfish a formalin bath in case they harbor Brooklynella, a common condition called "clownfish disease." I also recommend adding garlic to the food of all quarantined fish as a general immune system stimulant (Colorni, et al. 1998) and as a de-worming agent (Fairfield, 1996 and Jedlicki, pers. comm.). quarantined fish should the need arise. 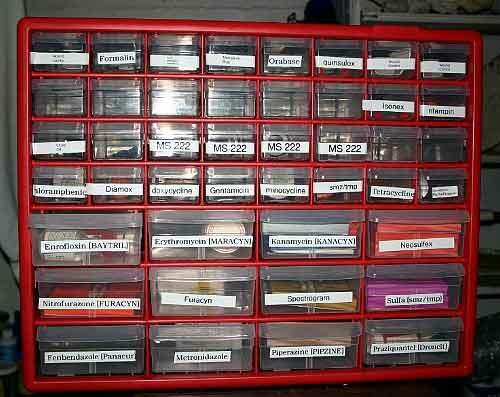 Photo by Steven Pro of Kelly Jedlickis fish medicine chest. Unlike fish prophylaxis, I don't recommend any preventative treatment for the invertebrates I purchase. I don't freshwater dip, iodine dip, or use any sort of commercial bath on any of my corals. I don't believe we hobbyists understand nor can we properly identify most coral pathogens or pests, so I use only close, careful observation over time during the quarantine of corals. 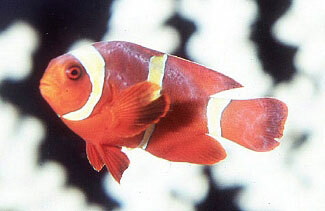 If something can later be identified, such as pest flatworms, Acropora copepods, or any other pests, it is far better to deal with it in the quarantine tank where there is no possibility of spreading it to other specimens or of collateral damage to beneficial fauna in the display from the treatment. Quarantine everything! Fish, corals, clams, anemones, live rock, live sand, mobile invertebrates, and everything else that is wet. When in doubt, quarantine! A properly run quarantine tank is the best possible way to ensure the safety and well being of all your aquatic pets. A competition free environment is the best place to allow fish and corals time to recover after enduring the stress and damage from shipping. There are a staggering number of potential pests, predators, and pathogens that we want to avoid introducing to the display. And, to make matters worse, not all of them are readily apparent upon first purchase/inspection. If the tank does become infected, it cannot be assured that any alleged 'reef-safe' medication is not harming some inconspicuous, but important, part of the overall ecosystem. Completely eradicating an introduced problem is always more difficult and more costly than keeping said problem out in the first place. A quarantine setup can be extremely simple and affordable, yet effective, with some forethought and planning. Having a fully functional and cycled biological filter is key to a successful quarantine period. The quarantine tank's lighting used when housing photosynthetic creatures need not be very expensive nor as high intensity as the main display. The animals merely need to be kept alive. Maximizing coloration or growth at this point is un-necessary. Any deficiency in lighting can be balanced by feeding. Use prophylactic treatment sparingly. Don't treat anything and everything, but be aware if the particular species is known for certain ailments and act accordingly. A proper quarantine period is at least one month long if everything goes perfectly. If a specimen refuses to feed, needs to be treated for a disease, or just doesn't behave appropriately for its species, the countdown to introduction to the display should not begin. Some specimens are going to be in quarantine for two months, or perhaps longer, because they need to be treated and the treatment protocol lasts a month. And finally, if you can't commit to these practices, don't waste your time because you will eventually run into trouble and want to blame it on quarantine as a practice instead of your incorrect application of the technique. Hopefully, I have convinced the reader what a smart and safe idea a proper quarantine setup is. Actually, I really hope that I have scared aquarists not using quarantine, because the very real fear of what can happen may prompt the use of a quarantine setup. If not, I wish you the best of luck because you are going to need it. As I said, those of us who have the experience of years know the repercussions of not using quarantine all too well. Borneman, Eric. 2001.Aquarium Corals: Selection, Husbandry, and Natural History. T. F. H. Publications, Neptune City, NJ, page 392. Calfo, Anthony. 2001. Book of Coral Propagation. Reading Trees, Monroeville, PA, pages 349-351. Colorni, Angelo, Rami Avtalion, Wayne Knibb, Evelyn Berger, Barbara Colorni, & Bracha Timan. 1998. "Histopathology of sea bass (Dicentrarchus labrax) experimentally infected with Mycobacterium marinum and treated with streptomycin and garlic (Allium sativum) extract" Aquaculture 160 (1998) 1-17. Delbeek, J. Charles & Julian Sprung. 1994. The Reef Aquarium: Volume One. Ricordea Publishing, Coconut Grove, FL, page 283. Dickerson H.W. and Dawe D.L. 1995. Icthyophythirius multifiliis and Cryptocaryon irritans (Phylum Ciliophora) In: P T K Woo (ed.) Fish Diseases and Disorders. Volume 1: Protozoan and Metazoan Infections. CAB International, Wallingford, Oxon. pp 181-227. Fairfield, Terry. 1996. "Garlic & Your Aquarium" Aquarium Fish Magazine, January 1996. Fenner, Robert. 1998. The Conscientious Marine Aquarist. Microcosm Ltd., Shelburne, VT, pages 120 & 153-155. Moe, Martin. 1992. The Marine Aquarium Reference: Systems and Invertebrates. Green Turtle Publications, Plantation, FL, pages 171-187. Noga, Edward J. 2000. Fish Disease: Diagnosis and Treatment. Ames, IA: Iowa State University Press. pages 97-99, 282-283, and 286-288. Paletta, Michael. 2001. The New Marine Aquarium. T. F. H. Publications, Neptune City, NJ, pages 113-115. Shimek, Dr. Ron. 2002. "Pills, Parasites, and Predators; Isopods in the Reef Aquarium" ReefKeeping Online Magazine, May 2002. Tullock, John H. 2001. Natural Reef Aquariums. T. F. H. Publications, Neptune City, NJ, page 253-254. Trevor-Jones, Andrew. 2002. "Quarantining Your Fish" Reefkeeping Online Magazine, February 2002. "Quarantine Your Fish!" Seascope, Volume 7, Spring 1989. Bartelme, Terry. 2004. "News on the Warfront with Cryptocaryon irritans, Part 5." Advanced Aquarist Online Magazine, March 2004. Bartelme, Terry. 2004. "News on the Warfront with Cryptocaryon irritans, Part 4." Advanced Aquarist Online Magazine, February 2004. Bartelme, Terry. 2004. "News on the Warfront with Cryptocaryon irritans, Part 3." Advanced Aquarist Online Magazine, January 2004. Bartelme, Terry. 2003. "News on the Warfront with Cryptocaryon irritans, Part 2." Advanced Aquarist Online Magazine, December 2003. Bartelme, Terry. 2003. "News on the Warfront with Cryptocaryon irritans, Part 1." Advanced Aquarist Online Magazine, November 2003. Pro, Steven. 2003. "Marine Ich/Cryptocaryon irritans: A Discussion of this Parasite and the Treatment Options Available, Part 2." Reefkeeping Online Magazine, October 2003. Pro, Steven. 2003. "Marine Ich/Cryptocaryon irritans: A Discussion of this Parasite and the Treatment Options Available, Part 1." Reefkeeping Online Magazine, August 2003. Pro, Steven. 2004. "Marine Velvet/Amyloodinium ocellatum: A Discussion of this Disease and its Available Treatment Options." Reefkeeping Online Magazine, July 2004. Borneman, Eric. 2002. "The Coral Health and Disease Consortium: New Information on Coral Disease." Reefkeeping Online Magazine, March 2002. Hiller, Greg. 2003. 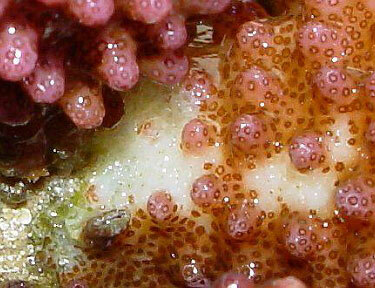 "An Aquarist's Experiences with a Species of Acropora Parasites" Advanced Aquarist Online Magazine, June 2003. Perun, Blane. 2003. 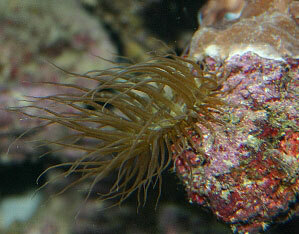 "Coral Predators: The Aeolid Nudibranch" Freshwater And Marine Aquarium Magazine, March 2003. Shimek, Dr. Ron. 2001 "Coral Fleas" Tropical Fish Hobbyist, December 2001. Shimek, Dr. Ron. 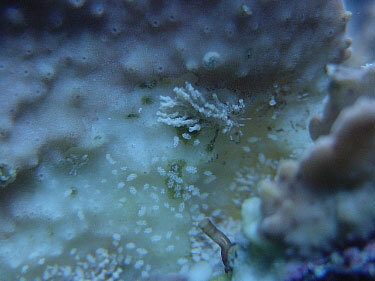 2002 "Bitty Bugs: Copepods in the Reef Aquarium." Reefkeeping Online Magazine, October 2002. Borneman, Eric. 2003. 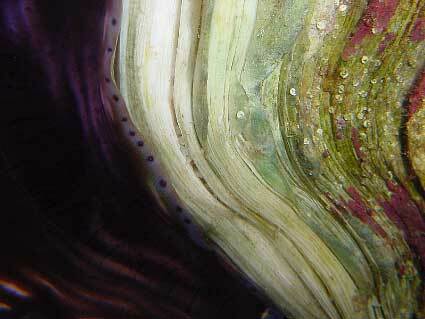 "The Food of Reefs, Part 7: Dissolved Nutrients" Reefkeeping Online Magazine, April 2003. Borneman, Eric. 2003. 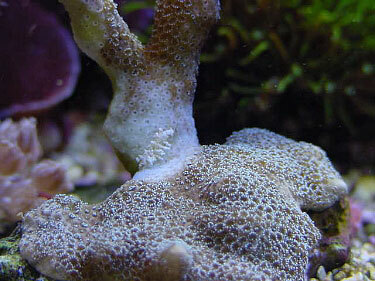 "The Food of Reefs, Part 6: Particulate Organic Matter" ReefKeeping Online Magazine, March 2003. Borneman, Eric. 2003. 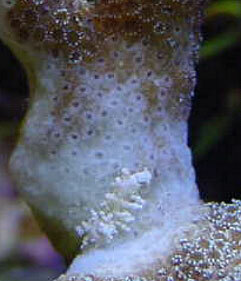 "The Food of Reefs, Part 5: Bacteria" Reefkeeping Online Magazine, January 2003. Borneman, Eric. 2002. "The Food of Reefs, Part 4: Zooplankton" Reefkeeping Online Magazine, December, 2002. Borneman, Eric. 2002. "The Food of Reefs, Part 3: Phytoplankton" Reefkeeping Online Magazine, October 2002. Borneman, Eric. 2002. "From the Food of Reefs to the Food of Corals." Reefkeeping Online Magazine, August 2002. Borneman, Eric. 2002. "Reef Food." Reefkeeping Online Magazine, July 2002.